In Part 1 of the “Adjusting to a New Bike” series, I told about the challenges I faced transitioning from my trusty 2005 Kawasaki ZX6R track bike that I had for 5 years to my new-to-me 2012 Triumph Street Triple R.
You may wonder why I think “Adjusting to a New Bike” is a topic worth spending time on. The fact is that I’ve seen and heard too many stories of people getting into trouble while trying a friend’s bike or when riding a new bike. In this post I will talk about an issue that can lead to a crash if you’re not careful – Unfamiliar brakes. One story I want to share involves a well-known safety journalist who took a well know safety instructor’s sportbike out and promptly totaled it. By all accounts, the reason for the crash was not a lack of skill, per say, rather it was a lack of familiarity with the power of sportbike brakes. Yikes! These aren’t my Brakes! The journalist’s brake hand (and mind) were calibrated to a large adventure bike, not the top-spec, radial mount, four piston anchors that the sportbike was styling. All it took was a driver pulling out in front of the journalist to cause the over-braking to happen. A skid ensued, followed immediately by the sound of plastic and aluminum grinding itself mercifully into the pavement. Luckily, the rider came out of it in better shape than the bike. 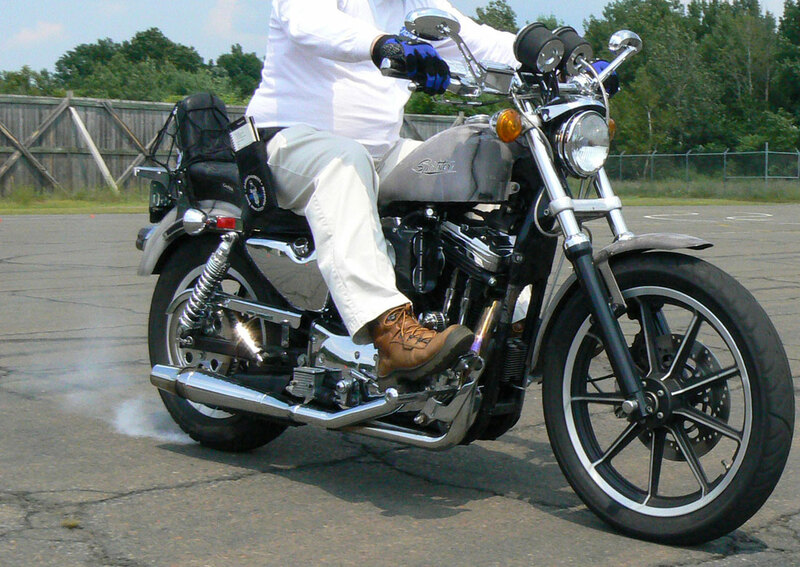 I ride a lot of different motorcycles on the street and the racetrack, one of the first things I do is test the power and sensitivity of the brakes. I squeeze the front brake a few times with varying intensity. I don’t ignore the rear brake as I press the pedal to see if it bites too abruptly and is prone to locking (many are), or is very weak, requiring significant pressure to get any useful brake force at all. The Street Triple is a hybrid in that the rear brake seems to be weak initially, but then grabs. This is something I discovered the first time I descended my gravel and dirt driveway. Oh, and yes, I do use the rear brake. That’s a topic for another post. Two fingers or Four? I say two on most sportbikes. Perfect practice makes perfect habits. And habits are what you’ll fall back on in an emergency. Besides familiarizing yourself with the brake’s feel, you should also use good brake technique (always). 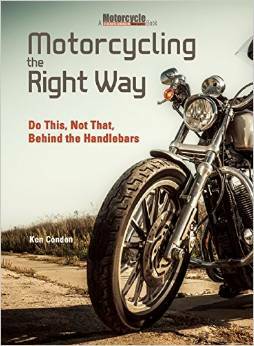 Determine whether you should use four fingers on the front brake or if two fingers might give you better control. No matter how many fingers you use, be sure to always SQUEEZE the front brake lever progressively. Grabbing a handful of brake lever will lead to nothing good. It will likely skid the front tire and you will be pile-driven into an unforgiving bit of very hard tarmac or dirt. In most cases, this happens because you didn’t give enough time for the load to transfer onto the front tire contact patch. With little load on the front tire, the powerful front brakes can easily overwhelm the available traction. Instead of a skidding front tire, it is possible to find yourself staring at your front wheel as you get flung forward. Or you may end up doing a stoppie. However, more times than not, the front tire skids before either of these occurrences happen. To prevent a skid, always squeeze and then squeeze harder if necessary. I’m glad I found this series; I have always ridden really big bikes — Started with a HD Street Glide and owned HD touring bikes, then bought my first sport tourer (BMW K1300S), then a K1600GT. I now own a 2014 Striple and the adjustment to a smaller bike with less power feels strange. The “floaty” sensation under movement because the bike and I together (I’m 5’8″ and 136lbs) don’t weigh that much, and just trying to find the right body position on the bike is a challenge for me. I’m glad you made the comment about the rear brakes because just today I didn’t feel they were “biting” like they should. I never thought it would be this challenging to go to my first small bike! I switched up to a Buell XB9R from a 500cc bike. Six days later I was in the hospital with three broken bones. On the smaller bike, a hand full of brake just locked up the front wheel, something I knew how to deal with and had practiced in parking lots. On the XB, a hand full of brake threw me over the bars after I’d been cut off and brake checked. An hour of practice could’ve extended my riding season, instead of having it cut short. Sorry to her that, Brad. A similar thing happened to my daughter while we were on our way tot he high school parking lot to practice braking. The Buells are know for their somewhat overly touchy brakes…must be the large perimeter design. I locked the front brake of an early Lightning when I was riding at a Buell Battletrax event.